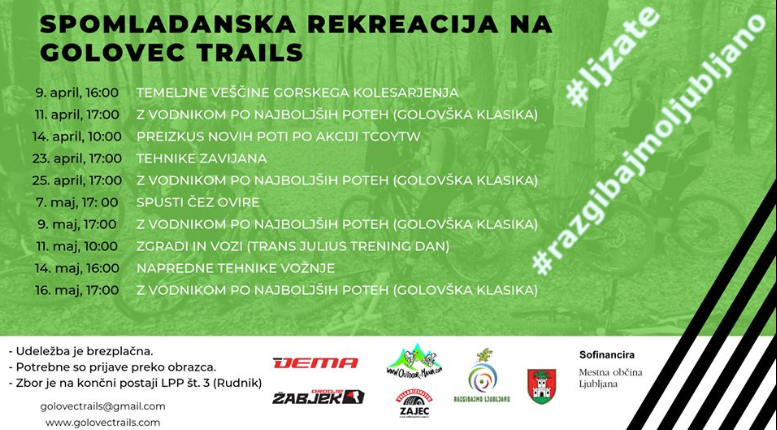 Golovectrails – Best trails in town! Small wooded hills of Slovenian subalpine region are the most popular among local mountain bikers. The vast forests which extend right from the center of our capital city Ljubljana hide numerous great trails and make the ideal place for riding your bike. Golovec trails is a sport association with the aim of encouraging and organising sport and recreational activities and maintaining mountain bike trails on Golovec hill in Ljubljana, Slovenia. To become first European capital with mountain bike trail park in its urban area! Development of mountain bike tourism in Municipality of Ljubljana, education of youth, trail builders and other staff who are oriented mainly towards cycling and organisation of MTB events. Want to become a world star trail builder? Or you just want to hang out and ride? Join or support us by clicking the below button! From the A2 Highway take exit Ljubljana-Jug and follow Dolenjska cesta to the crossroad with Hudourniška pot. Free parking is available at shopping center Rudnik (Cvetkova ulica). From the city center of Ljubljana you can come with a bicycle. Go to street Pot na Golovec and then follow the marks of Slovenian Mountain Bike Route (STKP) to Golovec trails. You can also find us on Trailforks. We currently offer about 6 kilometers of official trails . Most of them are natural single trails of varying difficulty. Trail routes are designed to be interesting for all categories of bikers. The main entry point is at Information table on Hudourniška pot, Rudnik, Ljubljana. You are also invited to check out the great video made by TwistedTrails. Would you like to experience European MTB capital on the rise? Golovec trails invites you to amazing adrenaline experience on a mountain bike in European green capital Ljubljana. Here you can sign in for our FREE MTB guided tour starting every Friday 10am from Hotel Park in Ljubljana. It is possible to rent a bike and a helmet for FREE! Coming back in June 2019! You want more trails? No problem! Book a tour with MTB tour agency Outdoor-Mania and explore other parts of Ljubljana and Slovenia on a bike. We recommend to all visitors, agencies, associations and other institutions to book our local guides and explore the trails with professionals who will show you all the secret spots of Golovec and guarantee you a good day. As we are heavily dedicated to educating, we invite all recreational mountain bikers of all ages to join our free courses this season. More information (in Slovene language) is available if you click the button below. First enduro race in history of Ljubljana is behind us and it was a blast! On Golovec in a near proximity of beautiful city center, 127 competitors from 5 countries battled on 3 stages for Enduro 4fun Golovec trails. It pleases us, that we hosted a record number of women competitors in Slovenia, some fast guys and girls from other disciplines and a lot of new faces. Spectators from all over Slovenia were cheering along whole stages, enjoying the race, fun games and good food. We are thanking our sponsors, supportes and everyone who helped with organizing this event. See you next time on #besttrailsintown!” You can read the whole report at SloEnduro.